The slime trend of 2017 is here to stay. 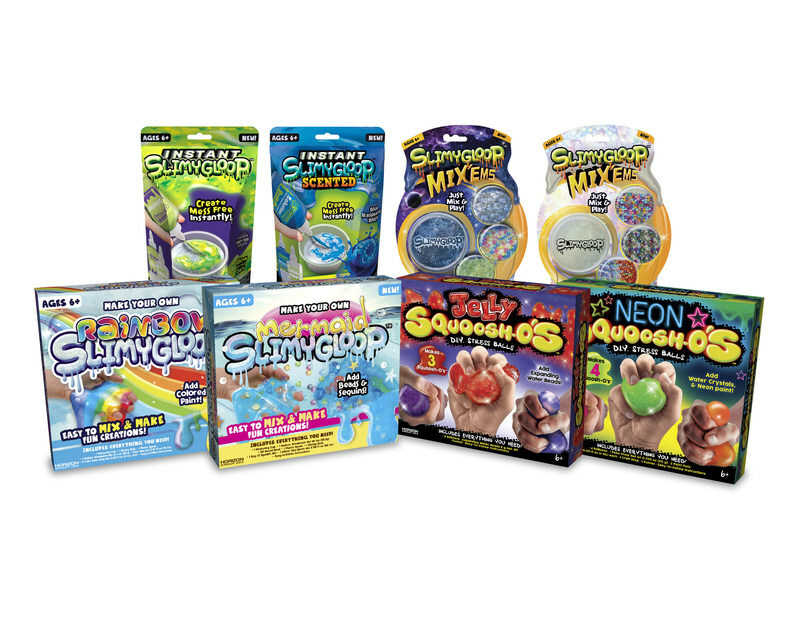 Horizon Group USA will continue to lead the arts and crafts industry with innovation as it expands its lines of D.I.Y., all-in-one slime-based kits. Following the widespread launch of the SLIMYGLOOP D.I.Y. brand, consisting of all-inclusive kits with ingredients and embellishments, Horizon Group expanded on the slime-making trend by creating new experiences for children. Instant SLIMYGLOOP™ provides an instant, less-mess activity for kids. In just three easy steps, kids can make slime by combining the Instant SLIMYGLOOP Activator and Solution. With SLIMYGLOOP™ Mix’EMS™, kids create their own compounds by simply mixing the included embellishments and collectibles into the pre-made SLIMYGLOOP for a fun, mess-free and safe way to play. In March, Horizon Group will build on its activity kits success with the introduction of SQUOOSH-O’S™, which allow children to create their own stress balls. The kits include everything needed to assemble unique SQUOOSH-O’S with each set featuring fun add-ins based on trending themes, delivering different satisfying and tactile experiences. SQUOOSH-O’S retail for $5.00 to $10.00 and will be available at a wide variety of retailers, including Amazon, Dollar General, Five Below, Michaels, Party City, Target, Wal-Mart and other fine retailers. Additional SQUOOSH-O’S themes will be added to the line and released throughout the year. In fall 2018, there is even more to come from Horizon Group! Beyond the extensions to their lines of SLIMYGLOOP D.I.Y., SLIMYGLOOP Mix’EMS, Instant SLIMYGLOOP and SQUOOSH-O’S, the company will be launching three additional trending brands. CraftProjectIdeas.com Wins Parents’ Choice “Fun Stuff” Award!